Piccotts End Cottages | The Dacorum Heritage Trust Ltd. In January 2002, we heard that our plans to set up a small museum at the cottages at Piccotts End near Hemel Hempstead, which contain the medieval wall paintings, had failed. Dacorum Borough Council had stepped in to buy the cottages when they came on to the market in 2000. A deal was agreed but was held up because match funding was sought from the Heritage Lottery Fund. The owners were not able to wait around for this to take effect and so sold the properties to a private individual. It is feared that there will be no access to the paintings in the foreseeable future for the general public. Our Chairman, Roger Hands, said “We hope the new owner will be willing to listen to professional advice upon the conservation of these nationally important paintings which are protected by law. It is disappointing to learn this news so tantalizingly close to the Heritage Lottery Fund decision in March”. In 1953 repairs were being carried out on one section of a row of cottages in the village of Piccotts End near Hemel Hempstead. 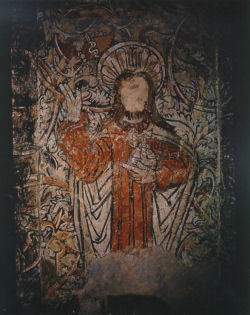 It led to the discovery by the owner, Arthur Lindley, of some remarkable medieval wall paintings. They were found in an upper room hidden behind several layers of wall paper mounted on linen and attached to the wall. Later investigations revealed that the floor of this upper room was an insertion and that the wall paintings continued lower down. Work on the cottages revealed that the whole row must once have been one establishment of importance containing a Great Hall open to the roof, with twin doors at one end, presumably opening into the kitchens or buttery, with possibly another hall on the other side of the painted wall. The exact purpose of the building is not known, but there is a strong suggestion that it may have been a pilgrims’ hostel connected with the great House of Bonhommes at Ashridge. The paintings consist of five panels in the upper part of the wall and two panels – formerly three – in the lower part. In the centre is Christ in Majesty, blessing with one hand and holding the orb in the other. On the right is the baptism of Christ by St. John with an angel in the background. On the left a pieta, the Virgin holding the dead Christ in front of the cross. Also depicted is St. Peter, St. Clement, St. Catherine and St. Margaret of Antioch. The costume in these latter two figures date the paintings around 1470 to 1500. The cottages also feature an Elizabethan painted bedroom, a priest’s hide, fine examples of wattle and daub and a medieval well. The cottages also provide another fascinating story. A series of buildings to the rear of the cottages, now demolished were used in 1826 by Sir Astley Cooper, the most eminent surgeon of his day, as one of the country’s first cottage hospitals. Sir Astley, who lived opposite the cottages across the other side of the valley at Gadebridge House, received his title for operating on King George IV.